Sorry KM Black Manta is no longer sailing/ not running trips. 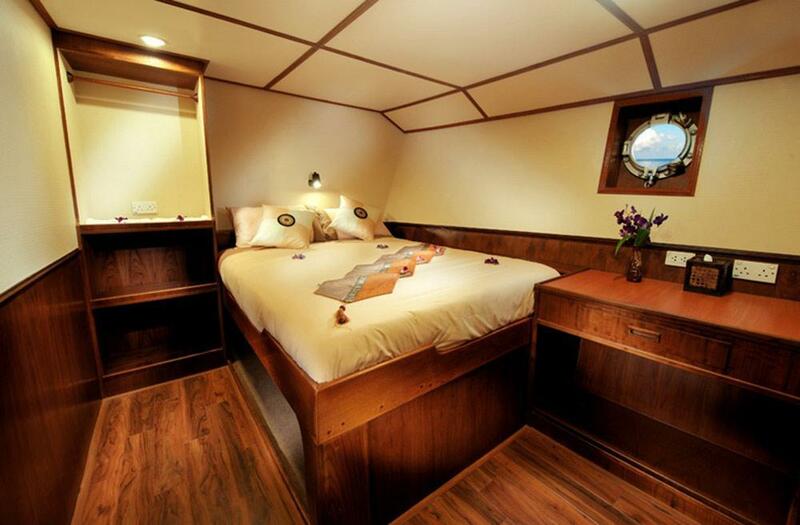 KM Black Manta is probably the most-respected liveaboard diving ship in Indonesia. It is large, making it safe and stable, purpose built for diving, and run by a professional team that ensure each of the sixteen guests enjoy the best diving in Indonesia. Most Indonesia liveaboards are modified fishing boats in the Phinisi style, which are attractive but not ideal for scuba diving. Black Manta has a steel hull, twin engines, and a dive platform designed by divers, for divers. 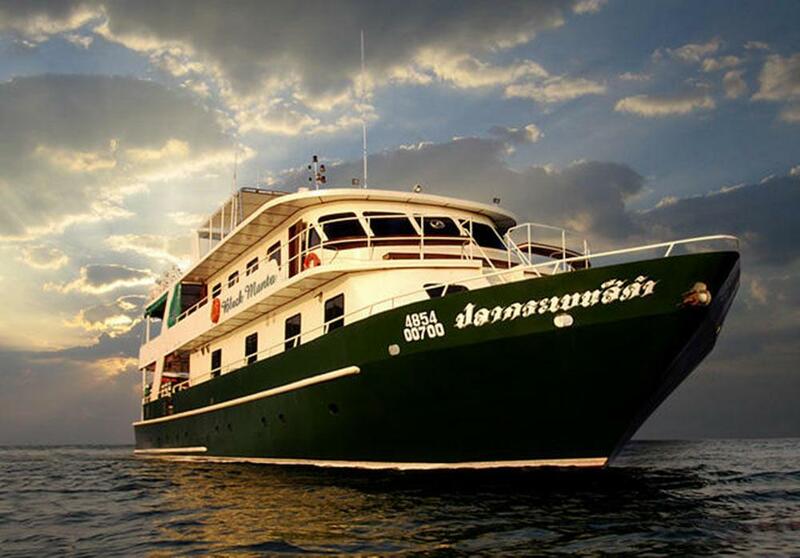 At 32m in length and less than 10 years old, this is an ideal boat to visit some of the world’s best dive sites, including all of the popular areas in Indonesia all year round. There is a large air-conditioned saloon, a stainless steel fitted kitchen, large dining area, and lots of places to relax alone or socialize in groups, both inside and outside. Tea, coffee, Milo & drinking water are free at all times, and delicious meals are served buffet style throughout the day. There’s always plenty of delicious local & western food to choose from. Black Manta comes equipped with AV entertainment, including a large wall-mounted flat-screen tv, with dvd player. Each of Black Manta’s eight cabins are air-conditioned and have en suite bathroom facilities with hot & cold fresh water. The décor is extremely tasteful, using local wood and soft lighting. 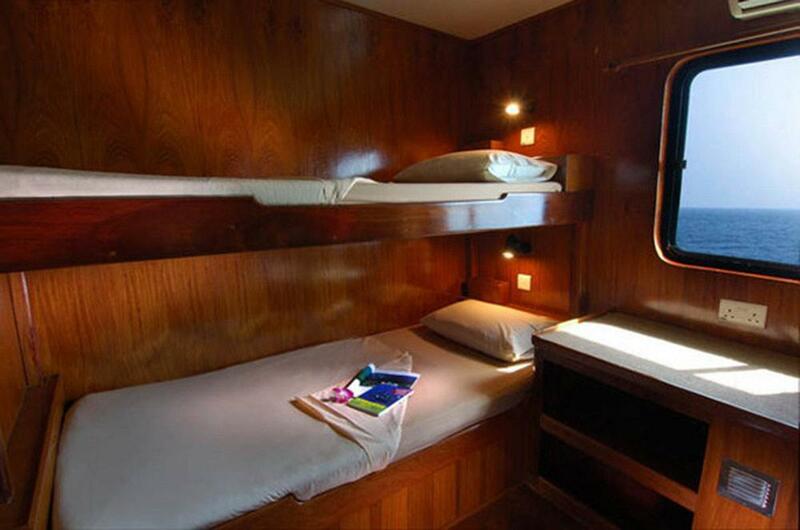 There’s a choice of double bed and twin bed cabins, and even two cabins with a double bed and a single bunk above it. 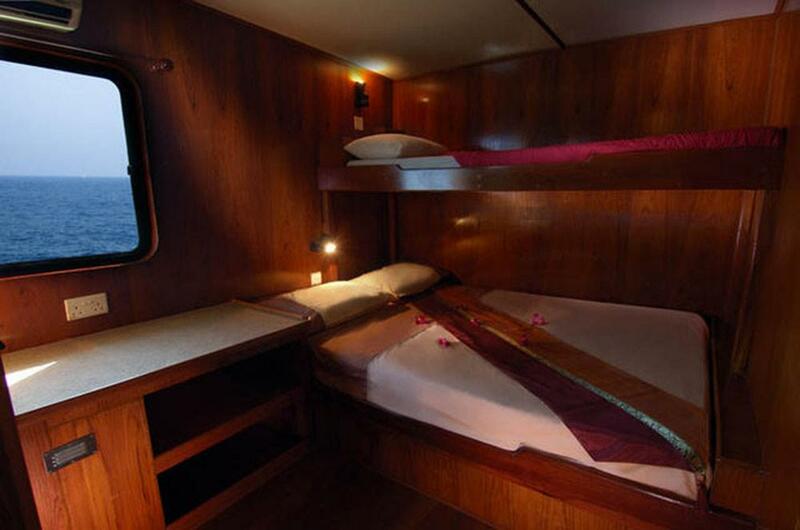 Those who really want to indulge themselves can pay a small extra fee for Thai / Indonesian massage on board and there’s a wide range of soft & alcoholic beverages and Nespresso coffee at reasonable prices. 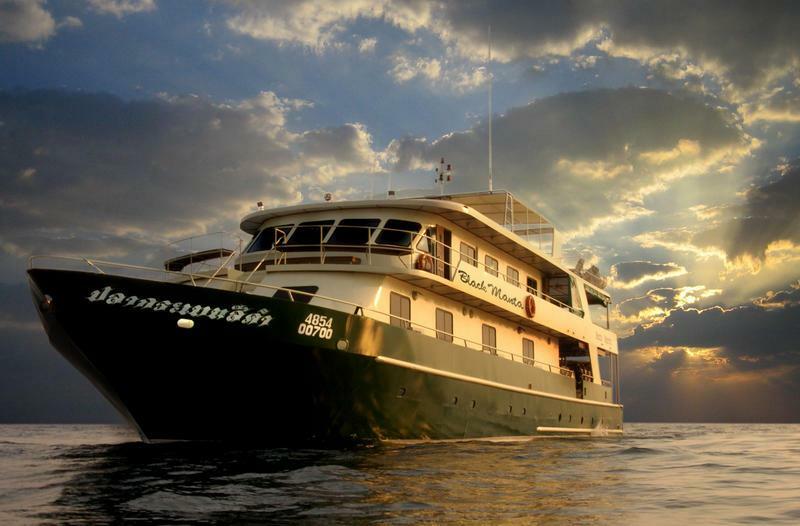 Liveaboard diving in Indonesia is not just about luxury, though. The fantastic range of marine life flourishes in unpolluted and mostly unchartered seas that often have currents and waves. KM Black Manta is an extremely safe vessel, as is diving from it. There is a full complement of safety equipment on board and every diver is given their own SeaSafe beacon which operates on a GPS system in the highly-unlikely situation that they drift away from the main boat or one of its 3 tender dinghies. Finally, Black Manta is always in the right place at the right time of year. The team ensures that guests experience the best marine life and sea conditions by rotating the trips around Indonesia’s best diving areas. 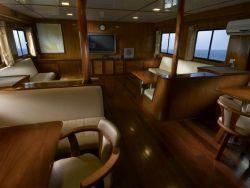 For the first few months of the year the boat sails around Raja Ampat in the far east of Indonesia, around West Papua. 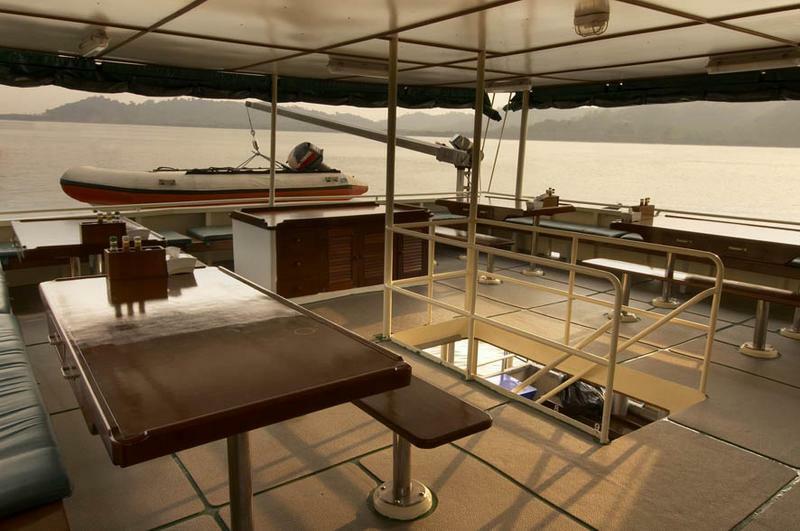 Then from May to September, the ship offers cruises at the world-famous Komodo Islands. Then for two months Ambon, Banda, and The Ring of Fire are Black Manta’s diving destinations before returning to Raja Ampat to start the cycle again. For the best diving in Indonesia, all year round, there really is little to compete with KM Black Manta. There are several KM Black Manta itineraries, and each is a good/typical example of what to expect on each cruise. Please make sure that you are reading the correct itinerary for the cruise of your choice. Please also note that elsewhere on the internet you may notice others advertising the same trips but showing an extra day. In most cases Black Manta trips sail in the night or guests disembark early in the morning. We prefer to advertise trips as honestly as possible. For example, a trip that sails at lunchtime and returns 5 days later, with guests spending less than 120 hours on board should be shown as 5D/5N, and not 6D/5N – even if it does span 6 calendar days. 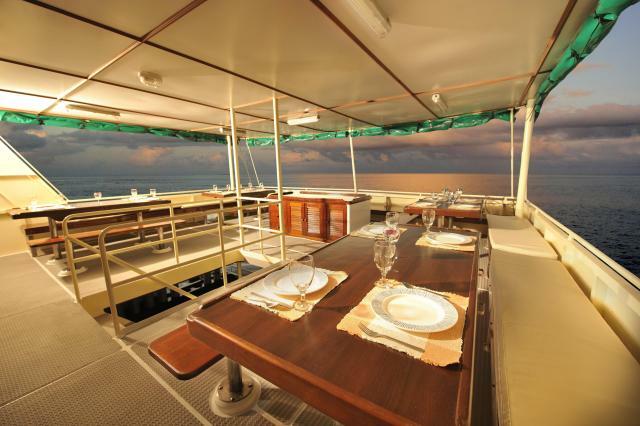 Each itinerary is subject to occasional minor changes of the dive sites visited. This depends on the sea & weather conditions, recent marine life sightings, and the needs and certification levels of the paying guests on board. The captain and tour leader always make decisions based firstly on the safety of all on board and then on the enjoyment and comfort of the guests. 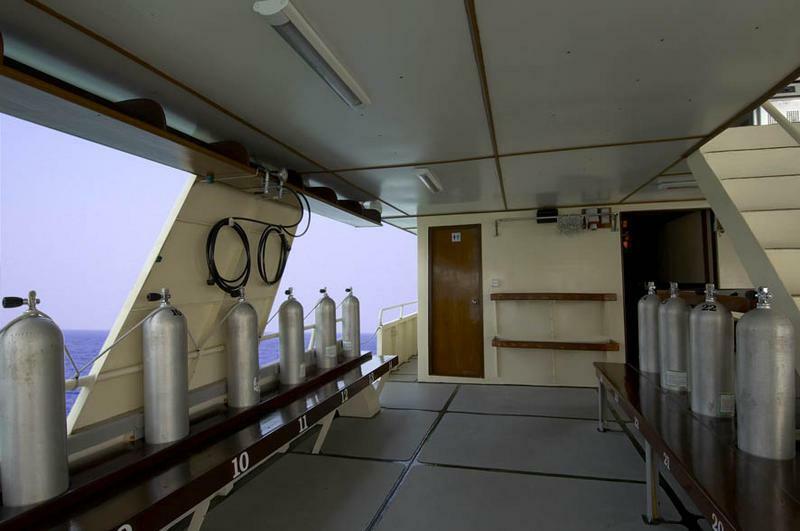 Spending up to a week or more aboard a ship designed and used purely for scuba diving is an ideal opportunity to further increase your diving certification level and ability. There are several PADI diving courses available on KM Black Manta, including courses for beginners to high levels. Although enjoyment & relaxation are what most Black Manta guests come on cruises for, safety and professionalism is always most important. The PADI courses are taught in a friendly way and always in the right circumstances and sea conditions. Also, understanding what you learn is easiest when in your preferred language. Therefore, please let us know as soon as possible if you are interested in taking a PADI diving course on your Black Manta cruise. We will do all we can to prepare and provide the right instructor and materials. PADI course on Black Manta are extremely good value, and often much cheaper than doing the same course while based on land. Please contact us for the best rates on any PADI course. KM Black Manta sails from several different locations in Indonesia, depending on each trip's itinerary. Almost all of the piers, ports & harbours the ship sails from are located near a domestic or international airport. In most cases, there is free pick up from the airport as well as local hotels and resorts. This is also the same for drop off after the cruise. 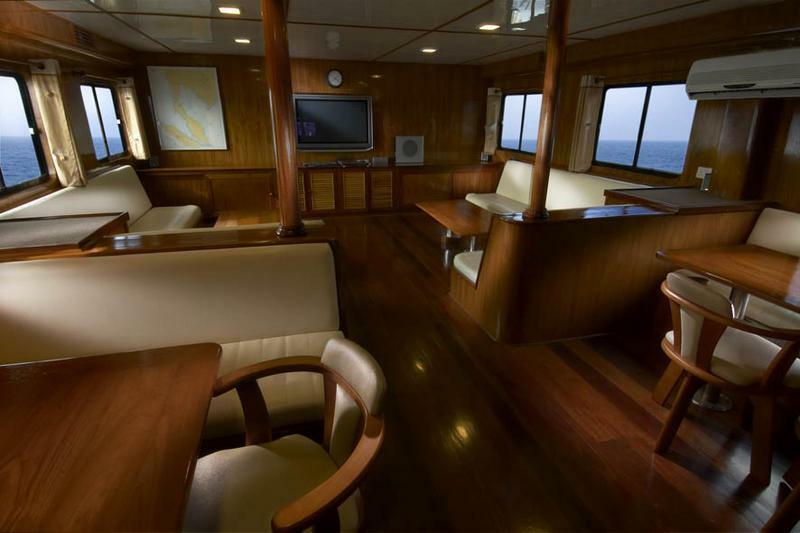 The two most common trips on KM Black Manta are at The Komodo Islands National Marine Park and at Raja Ampat. For Komodo diving cruises, 1-hour domestic flights from Bali to Labuan Bajo before the cruise take off and land in the morning. After the cruise the return flight is at lunchtime. Raja Ampat cruises depart from and return to Sorong, in West Papua. The flights normally come in during the afternoon, ready for an evening departure. Like Komodo, the flight after the cruise is around lunchtime. Don't worry about the mandatory '24-hour no-fly time'. 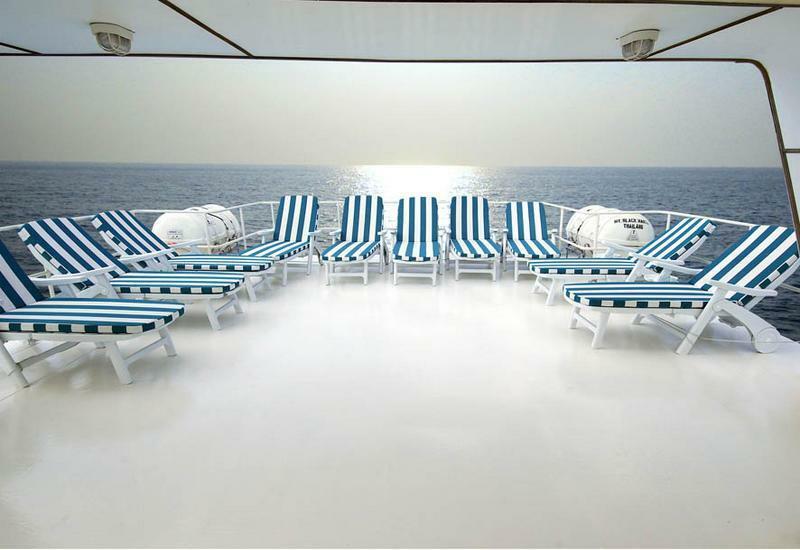 Each cruise's itinerary is planned around the most popular flights afterwards. For other cruises on KM Black Manta, the procedure is very similar. For all trips, please check the boat's schedule before arranging your flights. Sometimes it is difficult to use a credit card from overseas when booking domestic Indonesian flights online, and if you are able to it is important that you bring the credit card used for booking when you check in at the airport. We use a local booking agent who is experienced and helpful in organising domestic flights ideal for joining Black Manta diving cruises. Some airports in Indonesia give visas for free to holders of passports from dozens of countries. Other airports still charge for visa on arrival. Prices are 'per person' and include Divemaster guide services, weights & belts, 12 litre tanks. All meals and full-board accomodation is included. Tea, coffee, Milo & water are free of charge, with a small fee for soft drinks, Nespresso coffee & alcohol. 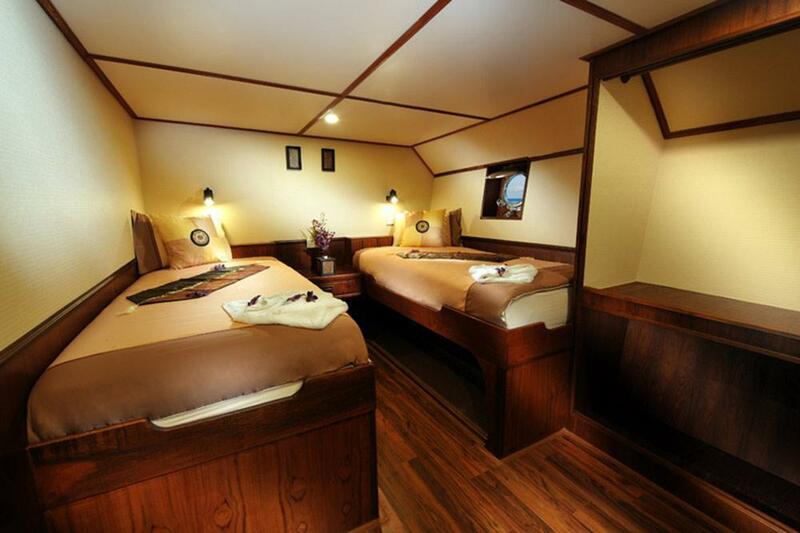 Toiletries, towels and cabin services are included. Diving insurance is compulsory on all KM Black Manta diving cruises. If you need help purchasing diving insurance, please let us know. National Marine Park diving fees vary on each trip, and are not included in the published rates. Divers who do not have their own equipment can rent full or partial sets at a competitive 'per day' rate. Please let us know as soon as possible if you wish to hire any diving equipment for your Black Manta cruise. Prices are correct at the time of publishing, and sometimes subject to small changes. Please let us know what you will need as soon as possible.